You are here : New York City Travel Tips » My Travel Tips » NY Panoroma Tips » Where to take the best pictures of New York? ├ Book a photo session in NYC! It’s fun to play with the architecture and places of NYC that look like some movies. A street with a good light, some buildings in perspective and some taxis and you will have a scenery for a perfect picture of New York. In fact I recommend that you take a picture from the ground, it will be as original as below, in this Meatpacking District photograph. In the streets of New York, the best is to have a wide angle lens, especially when the buildings are very tall or for very wide streets, as in the following picture. New York is a city well known for its skyscrapers, so if you can take your photos from one of them, you will have some great pictures. Take your photograph from a bar like the 230 Fifth Rooftop. In NYCTT I give recommendations to know when it’s preferable to visit the ESB and Top of the Rock. The evening boat tours are very nice, but to take pictures is more difficult. Indeed, the boat is in motion and it is difficult to take a picture that is not blurry. In Central Park, I suggest going to five places that have a nice view over the city. At the Southeast part of the park, there is a rock called "The Roc" from which you can take photos from. I love this photo of Gaëtan Habrand. From The Pond, there is a small lake southeast of the park which is also a very nice place to take pictures. There is a stone bridge, it’s always beautiful in the winter with snow, in spring or summer with green trees, or in fall with its changing colors. The Reservoir is a perfect place to run ... but also to take pictures! The High Line is a visit that I strongly recommend in NYCTT. It is about 10 meters high so you will have a good perspective of the streets of NY and the surrounding areas. Times Square is a mythical place in New York. The best is to sit on the red steps of TKTS, the company that sells tickets for Broadway musicals. Photographing New York from a helicopter is one of the most exciting ways to take pictures. The flight over the city itself is a great experience, but above all you’ll have an exceptional view for a picture of New York from the sky. It's something I highly recommend. For more information on the different flights, check this article in NYCTT. The sculpture is close to the MoMA. This bridge is located in Midtown, close to Grand Central. It offers a nice view of the street with the Chrysler Building at the bottom right and of Times Square in the back. 2 times a year, the sun sets right in the middle of the streets of New York. It is a phenomenon that cannot be missed, because it looks amazing. To see more information, read this post in NYCTT. Grand Central is one of the must-see places in New York. To see the main hall in one photo, you have to go to the Apple Store. Then you can get the large windows, the American flag and people passing through the station in only one pic. 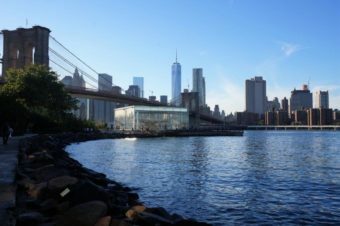 The place that draws my attention is Brooklyn with the Brooklyn Brooklyn Heights Promenade: It's a very nice walk of about 4.5 km with exceptional views of Manhattan, the Brooklyn Bridge and the Statue of Liberty. This place is easily accessible from Manhattan by subway or walking (F train to York St, then go under the Manhattan bridge, Washington St and voilà!). You may go by night and by day, but if you have to choose one, I recommend that you go at night: the illuminated panorama looks amazing. From Williamsburg, you can take nice pictures, for example near the Flea Market and the ferry landing. If you plan to visit the Queens, I recommend going to Gantry Plaza State Park. It is a place that gives a nice view of the skyline and of Midtown. The walk on the riverbanks of Hoboken and Weehawken are very nice. In fact, I also have a good tip to dinner at a restaurant in New Jersey here in NYCTT. It is one of the most famous landmarks in the world! You can visit the crown (see here) and take a picture like the one below. I also recommend having a wide angle lens if you want to visit to the crown and take pictures from there. What is more typical than the yellow cabs of New York? You can take a picture of them from several points of view and play with their speed. For those who want to get more original photos with the people of New York, you will see that you will be able to take many portraits. The tripod is mandatory to photograph New York at night. You can return to the places you liked during the day or go to one of the places that I recommended above. Book a photo session in NYC! Forget about the selfie, if you want a picture of you in New York City, book a photo session with a professional! We have your back with Johnny our photographer. Read more here in NYCTT. Take all the photos you can, you will never regret because then you can delete the one you don’t like so much. Try to get unique and original photos and avoid having the same photos that other tourists have. If you do not have all the necessary equipment, you can rent it at Adorama in NY. I hope that now you know where to take your photos once in New york. 2 responses to the post : " Where to take the best pictures of New York? " Thanks for all your tips of good photo locations in NY. It has certainly whet my appetite. Street photography and architecture are two of my favorite subjects, and there seems to be no end to the opportunities. I can't wait to see your photographs now! Don't hesitate if you have any question.